If everything goes well, your wedding day will be one of the most beautiful days of your life, and even if certain things go wrong, you will likely still look back and be left with a lovely memory. However, planning your wedding is an entirely different story. From picking out his and hers wedding bands to designing the seating chart, you will be faced with many different decisions along the way. If you’re the type who enjoys planning parties and events, this type of decision making might be right up your alley. If not, you may have to figure out a way to deal with the stress and keep your sanity along the way. Choosing whom you wish to invite to your wedding is often a source of tension between engaged couples. Sure, you want to show off your gorgeous his and hers wedding bands to everyone you know, and it would be great if that ex-boyfriend of yours could see how happy you are now. However, weddings are costly, and inviting everyone the two of you have ever met will likely break the bank. The best way to handle this issue is to sit down with your fiancé and make a list of the people you feel it’s most important to celebrate your love with. In general, if you haven’t seen the person for more than a year and don’t communicate with them regularly, they don’t need to be at the wedding. Once you have the guest list figured out, you may face another problem: two or more of your guests don’t get along. Hopefully, all the people in your life will be mature enough to put aside their problems and make the day about you and your fiancé, but if not, and you still feel it’s important to have these people at the wedding, you will need to play peacemaker. Your best bet is to talk with both parties and make sure they will be comfortable provided that you seat them away from each other. Your his and hers wedding bands will bond the two of you for life after the wedding takes place, but what happens if you can’t decide where the wedding itself should be held? There are many factors to take into account when it comes to choosing a wedding location, including how easily your guests will be able to get there. As much as you might enjoy getting married on a Thai beach, choosing to have your wedding there may dramatically shorten your guest list. If you and your fiancé are from two different areas of the world, consider choosing the location where the majority of your guests can most easily visit. Another option is to hold the wedding in a center point between both of your hometowns, so that guests from either place will only have to travel halfway. 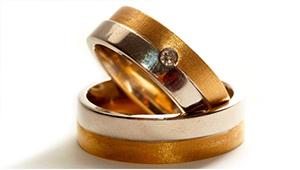 If you’re ready to pick out your his and hers wedding bands today, give Juno Jewelry a call. We offer customizable rings of all varieties, allowing you and your fiancé to create something truly unique and personal. Plenty of things can stress you out while planning a wedding, but choosing your rings shouldn’t be one of them! Give us a call or stop in today.